For Linda’s two weeks in Transylvania, I might as well start with the most famous (for Americans, at least) of all Transylvanian icons – Dracula. Of course, the “inspiration” for Bram Stoker’s Dracula was, in part “Vlad the Impaler” who lived in this place in the 1400s. Here’s just a line telling what kind of a guy he was from a publication in the 1500s: “He roasted children, whom he fed to their mothers. And (he) cut off the breasts of women, and forced their husbands to eat them. 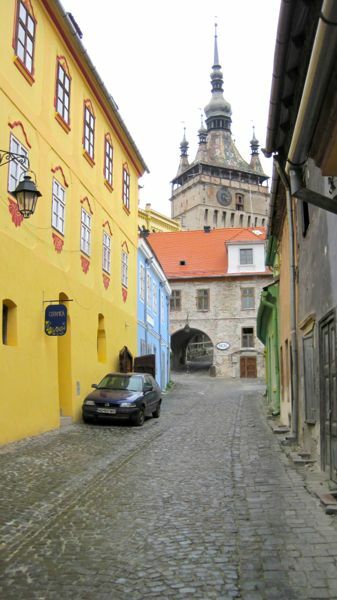 After that, he had them all impaled.” The city is named Sighisoara or Segesvár (the first is the Romanian name, the second is the Hungarian name; Transylvania was part of Hungary until the borders were redrawn after WW1 when it became part of Romania). 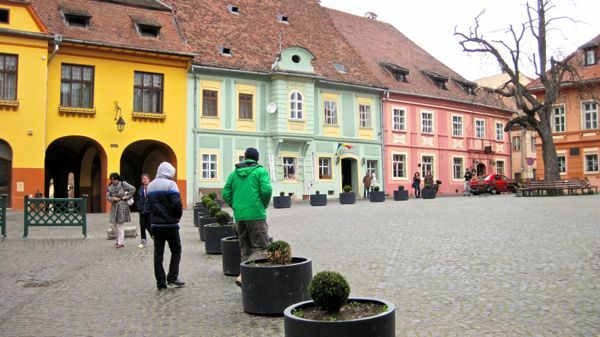 The fortified city was built in the late 1100s or early 1200s when the King of Hungary invited German craftsmen to settle and defend his kingdom. 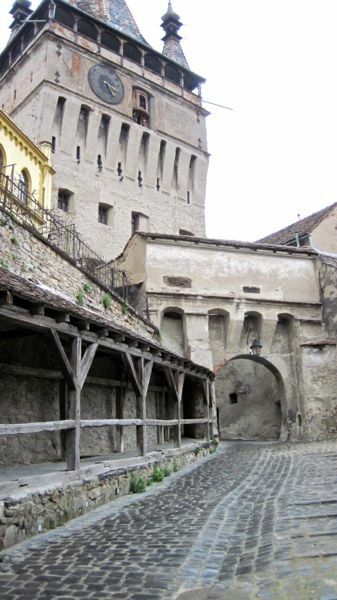 This place is one of the best examples of a preserved small medieval fortified city. It is considered a World Heritage Site by UNESCO. The approach to part of the city. These buildings are all inside the citadel. 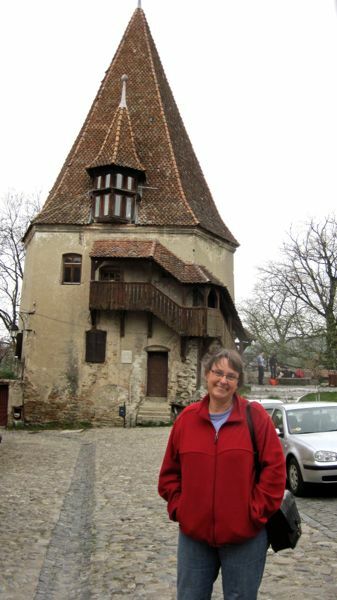 Linda in front of one of the bastions – each bastion was occupied by a separate guild where they would practice their craft and be on guard. A guild in medieval times according to Wikipedia is ” an association based on trades, confraternities of textile workers, masons, carpenters, carvers, glass workers, each of whom controlled secrets of traditionally imparted technology, the “arts” or “mysteries” of their crafts. Usually the founders were free independent master craftsmen who hired apprentices.